You'll hopefully forgive me for the number and size of images in this set of photos.....Brough just seems to be one of those sites that requires lots of photos from lots of different angles to do it justice. I need to pay a few return visits to make sure that this castle gets the coverage it deserves....it's a beautiful building an a fantastic location....added to which is an interesting and varied history. Brough village lies about six miles North of Kirkby Stephen, and sits astride the A66. The village possesses a beautiful medieval church (St Michael) with Norman remains incorporated into its fabric, a huge Roman fort, and, built over the top of these earthworks, Brough castle. The castle lies at the Northern end of the earthworks surrounding the ancient Roman fort of Verteris. The castle stands on a natural steep slope, protected by Swindall Beck which runs beneath the North walls of the castle. The oldest parts of Brough Castle date from around 1100. At around this time, Northern England had been annexed from the Scots by William Rufus. The castle was built to safeguard routes from the North across the Pennines into Yorkshire and South into Westmorland and Lancashire. Excavations in the 1920’s showed that the castle had always been built from stone, and that the present keep rests on the foundations of the original Norman tower. Similar stonework exists in some portions of the curtain wall. It’s likely that the layout as seen today, is the same as it was from the castle’s earliest days. The castle was built in an area that was continually fought over by Scottish and English monarchs. This seems to have been the case in 1173 and 1174. William the Lion invaded the North of England in 1173. He blockaded Carlisle, and marched his army South. Appleby was quickly overrun, then Brough was attacked. It is alleged that the castle was defended by six knights, each of whom would have had a large following. The bailey was overrun, and the defenders sought refuge in the keep. The attacking army set fire to the keep, which probably had a stone base and wooden superstructure. Some of the knights surrendered at this point, except one. He however, soon followed suit. The keep was all but destroyed, with the stone masonry remains the only surviving part of the castle. The remains provided the base for the new keep, the one that can be seen today. It was built in the late 12th century, and would have been the focal point of the castle as a whole. Above. Looking East onto the foundations of the stables. 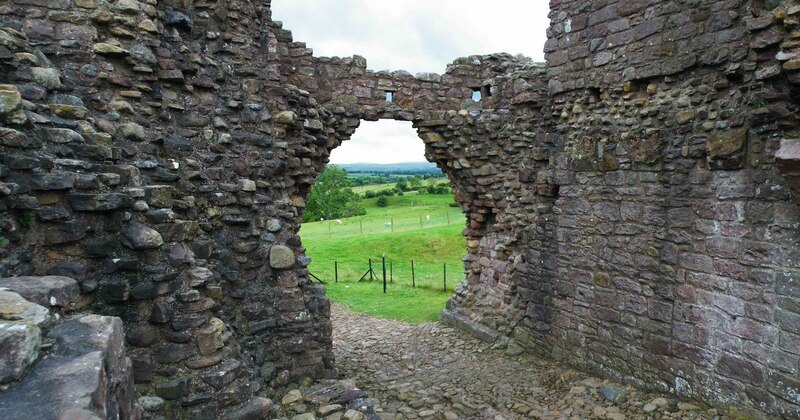 In 1203, King John gave the castle at Brough, along with the castle at Appleby and the lordship of Westmorland to Robert de Vieuxpont, the builder of Brougham castle. Vieuxpont built much of the castle at Brough as well. The gatehouse is attributed to him, as is the hall across the South end of the courtyard. However, Vieuxpont’s immediate relatives neglected the castle, and in 1254 it was described as being ‘decayed’. Above. Looking at the North face of the keep. Brough passed to the Cliffords in 1268. Robert Clifford began to carry out some major rebuilding works. He built a new hall on the same site of Vieuxpont’s hall. At the South end of the castle, he built a semi-circular tower known as ‘Clifford’s Tower’. This was the residence occupied by him and his family. He also undertook the restoration of the now decaying curtain wall. This was necessary work considering that the Scots were still a threat. The village of Brough was devastated by Scottish raids in 1314 and then again in 1319. In the early 1320’s, the castle garrison consisted of 15 men at arms and 20 Hobelers, light and heavy cavalry. Above. Looking East towards the inner range of ruined buildings. More building work was carried out at the castle in the late 14th century, during Roger Clifford’s ownership. The earlier hall was replaced as happened at Brougham, by a first floor hall set over a basement. The new hall was placed against the South curtain wall between Clifford’s Tower and the gatehouse. 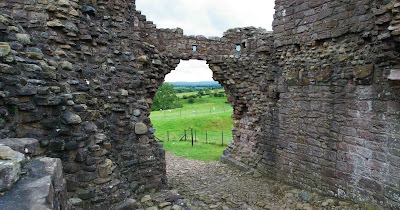 Brough castle escaped capture in the Scottish invasion of 1388, in which both Brougham and Appleby succumbed. Brough was usually the chosen place for the Cliffords to stay when they visited Westmorland. Roger’s hall was also added to, with buildings extending along the North side of the castle. The front of the gatehouse was also refaced. Most of this work was probably conducted by Thomas Clifford, who was later to die at the battle of St Albans in 1455 whilst fighting for Henry VI. Above. Looking East towards the site of the kitchens and the 12th century hall block. The castle was seriously burnt in 1521, after a great Christmas feast. All the wooden features of the castle appeared to have been destroyed in the fire, including floors, doors and windows, leaving the castle uninhabited until Lady Anne Clifford assumed ownership. Work began in 1659 to rebuild the castle. Lady Anne made a brief visit the same year, so work must have been at an advanced stage. An inscription commemorating her restoration work at the castle was put up at the end of 1663. Work on the castle was therefore probably finished by this date. In 1664, Lady Anne spent eight days in the newly refurbished castle, although it wasn’t until 1663 that she spent a longer time at the castle. She arrived on the 10th of November, and didn’t leave again until the 19th of April the following year. She visited for longer stays another three times, each time taking over the top floor of Clifford’s Tower. Above. A view from inside the Southern inner range of buildings. Lady Anne continued to make alterations to the castle, as well as building some stable blocks between the gatehouse and the keep, and a row of service buildings at the East end of the North curtain wall. After Lady Anne died, Brough fell into disrepair just like Brougham. Minor repairs to the roofs were made for a few years after her death, but these soon stopped in 1714. The following year, most of the roofs and fittings were sold for around £155. The stables along with parts of the gatehouse and hall were exempted from this sale, as Lord Thanet had plans to convert these buildings into a court room complex for the manor of Brough. There seems to be no record of how long these buildings served this purpose. And engraving dated 1739 shows that the stables had disappeared, and by 1763, a large portion of Clifford’s tower had been destroyed\dismantled to provide stone for the building of Brough Mill. Above. A vaulted cellar beneath the site of the 14th century hall. No effort seems to have been made thereafter to preserve the castle in any way. A report of 1919, states that extensive stone robbing had taken place, including the removal of moulded stones, lintels, staircase treads and pavements. Above. A view of the first floor of the Southern range of buildings. In 1920, the South West corner of the keep fell down, the remains of this collapse still visible today. The masonry still remains halfway down the steep earthworks, and a great open crack can be seen in the keep walls. Soon after the remains were consolidated, probably stopping any further decay. Above. 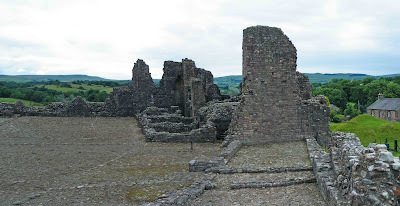 Panoramic view of the courtyard looking West towards the keep. The gatehouse as seen today is very much mutilated and ruinous. It would have originally been three storeys tall. In the 17th century, and probably earlier, the top floor would have been used as a guest chamber. The first and second floors each had external windows, and the commemorative slab that Lady Anne had mounted on the gateway arch stone would have been mounted here. The engraved slab was reputedly put under the water wheel at Brough Mill. Above. A view along the Northern curtain wall towards the keep. On either side of the entrance to the gatehouse, were pyramidal shaped buttresses, probably ornamental, although the gatehouse was designed to resist attack. There would have been a nail studded door at the gatehouse, and in earlier times there is the possibility that there would have been a portcullis and drawbridge. Above. The inner range of buildings built against the Southern curtain wall. The courtyard today is largely empty. The keep stands at the West end of the complex, with Clifford’s Tower at the South East corner. The stables were built along the inside of the South curtain wall, with the Great Hall and the inner range also along the inside of the South curtain wall, but between the gatehouse and Clifford’s Tower. The gatehouse was also in the South wall. 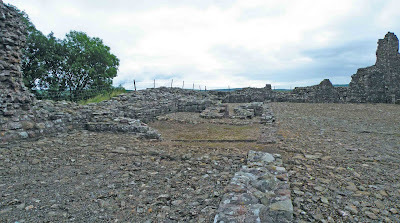 The kitchen and the bake house were both built against the inside of the North curtain wall, along with the brew house and the latrines (which can still be seen) The site of the 12th century hall was against the inside of the East curtain wall. Above. A view of the gatehouse from within the courtyard. Most of the rough sand stone cobbling in the courtyard is probably medieval. Along the North curtain wall, to the left of the brew house, a latrine survives, which would have discharged into Swindale Beck below. Above. An oblique view of the interior of the gatehouse. The first building to your left as you enter the castle’s courtyard would have been the stables. The large size of the stables indicates that the castle would have been home a large number of people. Above. Earthworks at the foot of Clifford's Tower, looking East towards Brough village. The keep would originally have had four corner turrets. There may be the remains of pigeon coups on the South and East side of the keep….providing some food for the residents. As at Brougham, the entrance to the keep would have been at the first floor, accessed by a flight of stone steps in Lady Anne’s time. The doorway to which these stairs would have led has long since vanished, as has most of the East wall of the keep. The base of the staircase can still be seen though. Above. The gatehouse and outer range of buildings. The basement of the keep acted as a store for the upper floors. It would have been entered by stairs from the floor above. The door in the North wall was made by Lady Anne. There are still remains of white plaster on the walls. This would have been done to increase the light in the dim rooms. Above. Earthworks outside the Southern curtain wall, and current inhabitants! Originally the keep would have had only two storeys over the basement, connected by a spiral staircase in the North East corner with a steeply gabled roof over the top. The outline of this roof can still be seen. This was later replaced with a higher roof, which allowed for another floor to be added to the keep. This additional floor was used as guest housing in Lady Anne’s time. Above. The keep from outside the curtain wall, looking North West. The steeply gabled roof of this portion of the keep was an ingenious addition to this part of the castle. Brough lacks a well, so the roof allowed for rainwater to be drained away from the roof and collected in an indentation in the middle. Thomas Machell does show a well attached to the castle, although this is sited outside the gatehouse. Above. Looking East towards Brough village. These three buildings lay in the North East corner of the courtyard, against the inside of the curtain wall. All were built by Lady Anne Clifford as part of the refurbishment of the castle. A coal hole was also built at this time, in 1669, although this has long since vanished. The castle would have paid hearth tax on 24 chimneys at this time. These buildings were one storey tall, and would have had a continuous slate roof. Above. Earthworks at the foot of the keep on its South side. This room was situated on the ground floor of Clifford’s Tower in the late 17th century. The square windows that can still be seen were put in by Lady Anne when she rebuilt large sections of the castle after the fire of 1521. Above. Looking East towards the gatehouse. These buildings, in the South East corner of the courtyard area mish-mash of two ranges of buildings. They consist of some late 14th century buildings built against some mid 15th century buildings. Two windows can be seen mid way up the wall….these would have lit the hall, as like at Brougham, the hall was on the first floor. Above. My favourite view of the castle, from the West. From the hall, a staircase would have led up to the Great Chamber on the top floor of Clifford’s Tower. This room would have served as a dining room for senior members of Lady Anne’s family. Her own chambers would have been reached by walking through this room. There were also chambers for her steward and her secretary and for a butler. An ‘evidence’ room also existed here, where valuables and papers were kept. Above. A view of the earthworks to the West of the castle's keep. Above. 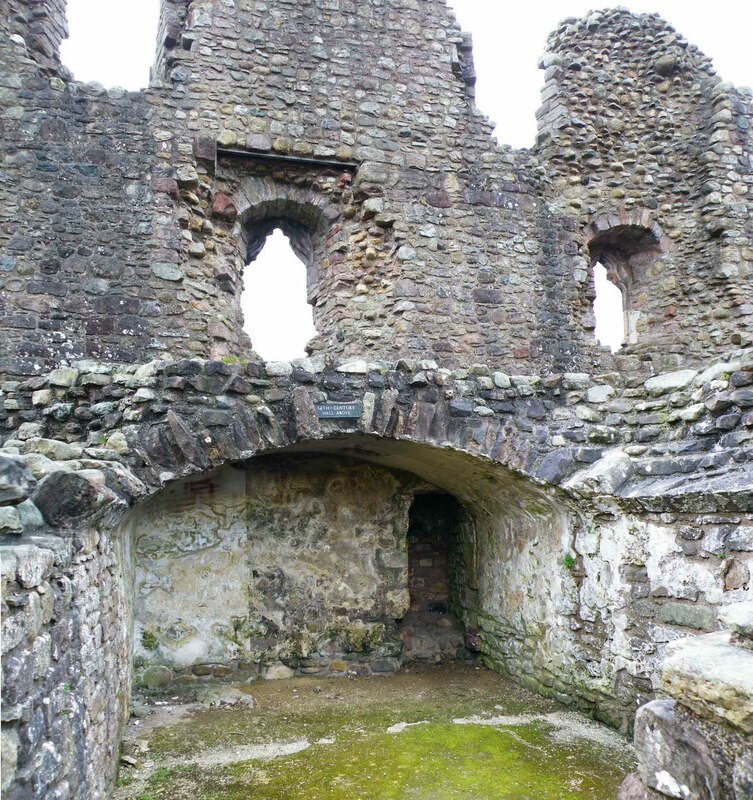 A view of the keep and Northern curtain wall from within the deep moat. Note the two chutes from the latrines built into the thickness of the curtain wall. Above. A view of the North East side of Clifford's Tower from within the deep moat. Above. Looking towards the North East side of Clifford's Tower from the adjacent earthworks. Above. Clifford's Tower from the South East. The rather disconsolate horses are nice. More the size of Norman War horses than the Irish hunters re-enactors usual use or the Shire horse used in some Hollywood movies.